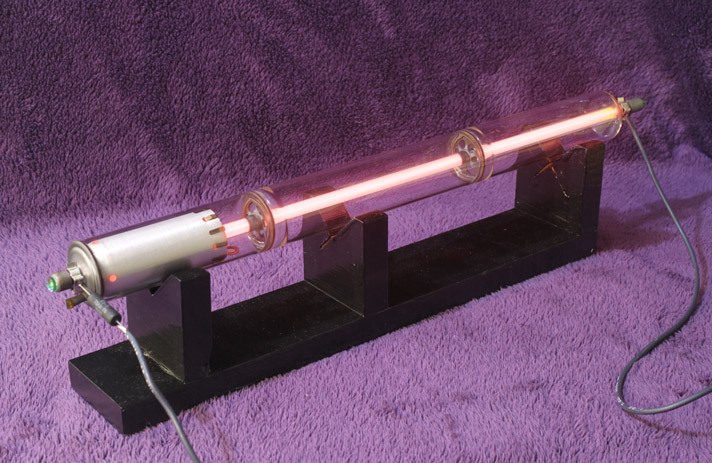 The last time I bought a green (543.5nm) Helium-Neon laser tube it was only about .2mW so this is quite a jump in power. At 19 inches it's the longest He-Ne tube I've ever seen. I have diode laser pointers that are more powerful but the beam is nowhere near as well collimated. I bought it on eBay from Meredith Instruments (check out their active auctions—their web site is here). They still have nine five left as I write (they started with 35). They were kind enough to include clips and a ballast resistor with it. I used the power supply I got with the last auction I won. I made the stand out of scrap wood, hot glue and some paint. Don't look to closely at it. I put more a lot work into the picture. Well, now that I look at it I realize that I have the ballast resistor on the cathode instead of the anode but it works anyway.